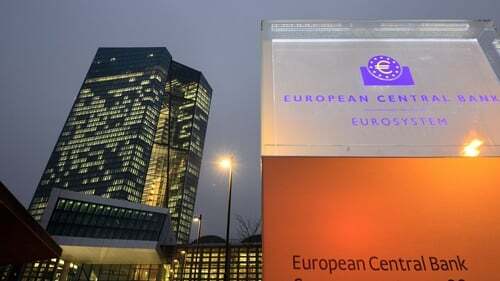 The European Central Bank is expected to wait until the fourth quarter to raise its deposit rate, later than thought just a month ago, according to economists in a Reuters poll. The poll also showed that the chances of a euro zone recession have grown. Reuters polls since June 2018 have predicted that after ending its asset-purchase programme in December, the ECB would follow with a rate rise in the third quarter of 2019, in line with the ECB's guidance. But a barrage of weak data - including news that Europe's top economy, Germany, barely skirted a recession in the second half of 2018 - suggests growth has slowed. This has persuaded economists to push forward that long-held forecast. They also slashed their growth outlook for Germany, France and Italy compared with an October poll. The ECB is now expected to raise its deposit rate, currently at -0.4%, to -0.2% in the fourth quarter and wait until early 2020 to raise its refinancing rate from zero to 0.2%. The latest Reuters poll comes at a time of tightening financial conditions and with Britain's scheduled exit from the European Union imminent but no agreement within the UK government on how to proceed. "Brexit, for the euro zone, is also an important risk - it might cause disruption in exports to the UK and that's an additional factor that might weigh on growth," Peter Vanden Houte, chief euro zone economist at ING, said. Only two respondents forecast the economy would shrink in 2020, but the median probability of recession in the next two years rose to 35% from 30% in December. That is the highest since Reuters started asking the question in July, and the second month in a row it has risen. More than a third of economists polled gave a 40% chance or more of a recession. And on a like-for-like basis, out of 36 common contributors in January and December, nearly two-thirds raised their two-year recession probability. Ten kept it at the same level. Only three lowered it. The chance of a recession this year also rose to 25% from 20% in December. ECB President Mario Draghi said earlier this week that the euro zone was not heading for a recession but needed support from the central bank as the slowdown could last longer than expected. The ECB ended its more than €2.6 trillion bond-buying programme last month but kept the door open for more if required. All 70 economists who answered an extra question said it would not restart purchases this year. Most economists now agree that global growth, as well as US growth, has peaked. Consequently, a dilemma may soon present itself. Asked how confident economists were the ECB would be able to raise rates before the next downturn, only 36 of 65 said yes. The latest Reuters poll suggests inflation, which the ECB targets at just below 2%, will average 1.6% this year and next, similar to last month's poll. Growth will average 0.4% in each quarter up to the middle of next year, according to median forecasts in the January 9-17 survey of over 90 economists. Forecasts for 2019 full-year average growth were trimmed to 1.5%, the lowest in over a year of polling for that period, and below the ECB staff's 1.7% projection. The 2020 forecast was 1.5%.